Here are some traditional wedding cakes from Western Europe, perhaps one of them is just for you? 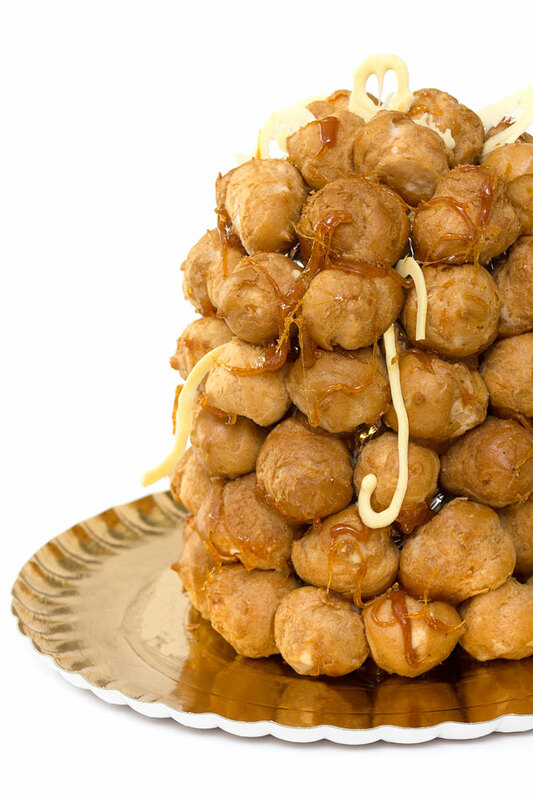 My personal favourite wedding cake is called a croquembouche and it is the traditional wedding cake of the French. This cake is basically a pyramid-like tower made of cream-filled pastries covered in spun sugar. I went to a wedding once where the groom flamboyantly cut the croquembouche with a sword, but I can’t seem to confirm if there was a tradition behind the sword or if my friend was simply a bit quirky! Italians do not always serve cake at weddings but when they do they usually serve a dessert called a millefoglie which consists of alternating layers of puff pastry and sponge cake and is filled with berries (usually strawberries) and cream. In Germany they like to serve rich nut or genoise sponge cakes at weddings. These cakes are soaked in liqueur or syrup and are incredibly rich. They are garnished with jam, marzipan and nougat and they are frosted with fondant of ganache. Using artificial colours when decorating these cakes is considered tacky and so German wedding cakes are not manipulated to match the rest of the wedding décor. The very traditional wedding cake found at Greek weddings is meant to symbolise a couple’s enduring commitment to one another is made of honey, sesame seeds and quince. The more popular, though slightly less traditional, option is a flourless almond cake filled with fruit and custard and covered in almonds.